As the latest of the six British-built Ebola treatment centres in west Africa admitted its first three patients this weekend, some of the volunteer NHS staff working there over Christmas said they felt insulted by a draconian ramping up of the protocols they have been told they will have to follow when they return to the UK. Public Health England (PHE) has told the NHS personnel it is increasing restrictions on their movements when they return from the frontline of Ebola-infection, banning them from travelling on public transport for longer than an hour and increasing from two to three the number of weeks before they can return to work. For Dr John Wright, a clinical epidemiologist from Bradford working at the clinic at Moyamba, Sierra Leone, which opened on Friday, it was a slap in the face for him and his colleagues. “It’s a return to the ecology of fear that they insisted they were going to steer clear of,” he said. “No travel, no shared accommodation, no clinical work, a fever parole officer to report to daily. Why not issue us with plague masks and bells? The Moyamba centre, funded by UK aid, built by Royal Engineers and run by Doctors of the World, will slowly scale up to 100 beds. In a statement from PHE, Professor Paul Cosford, the director for health protection, said: “As a precaution we have updated the existing advice for returning healthcare workers to indicate that they should not return to clinical work for three weeks after their return to the UK. This brings our guidance in line with other organisations sending volunteers to affected countries, including the Ministry of Defence. “The guidance also states that all returning workers who have provided direct treatment for people with Ebola should avoid long-distance travel and going anywhere where they cannot easily and rapidly obtain medical help if they become unwell. “The update is a practical and sensible approach to ensure returning healthcare workers have passed the incubation stage before they have direct contact with patients in the UK, and that they have easy access to healthcare facilities should they start to develop symptoms. “It’s important to stress that the risk itself has not changed. 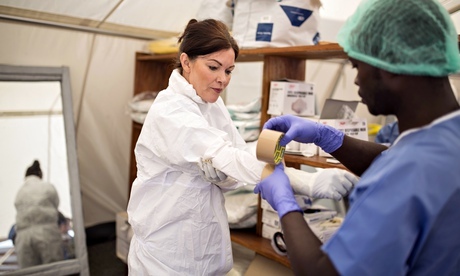 Several hundred humanitarian and healthcare workers from the UK have travelled to Ebola-affected countries since the start of the outbreak with no cases subsequently being diagnosed in the UK. “We also need to recognise the great contribution and dedication of the volunteers and do all we can to ensure they do not face discrimination or experience stigma of any kind on their return to the UK. Family, friends and colleagues may naturally be concerned but I want to reassure people that the robust system we have in place is designed to minimise the risk both to volunteers and the public. According to the World Health Organisation, more than 13,000 people have been infected during the west African outbreak and more than 5,000 people have died. Dr John Wright has been recording his experiences for a BBC Radio 4 series.